Hello, everyone! 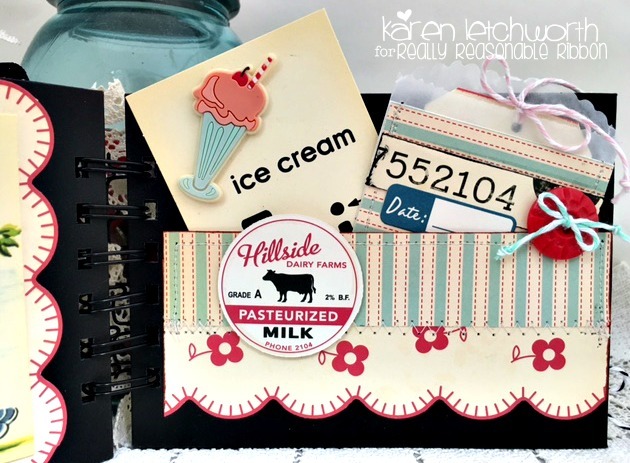 Welcome to the Really Reasonable Ribbon Blog today as I (Karen) share a sweet mini album I created using lots of great OA supplies and Really Reasonable Ribbons goodies. I started my mini album with some black chalkboard envelopes that I cut using my Zutter binding machine to add the spiral binding. 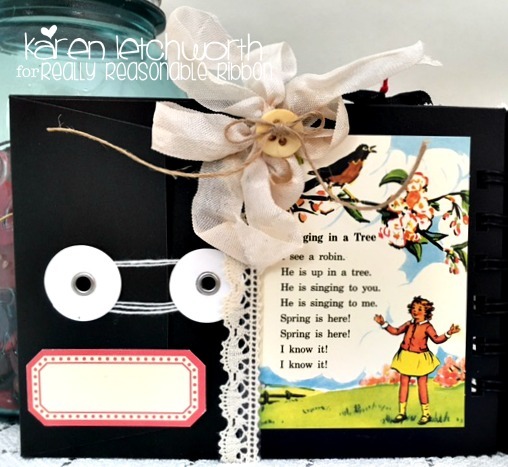 I covered each page of the mini alnum with October Afternoon patterned papers and embellishments, and adorned them with lots of luscious Really Reasonable Ribbons that I will explain as I showcase each lovely page of the mini album. This will be long, so please bear with me. 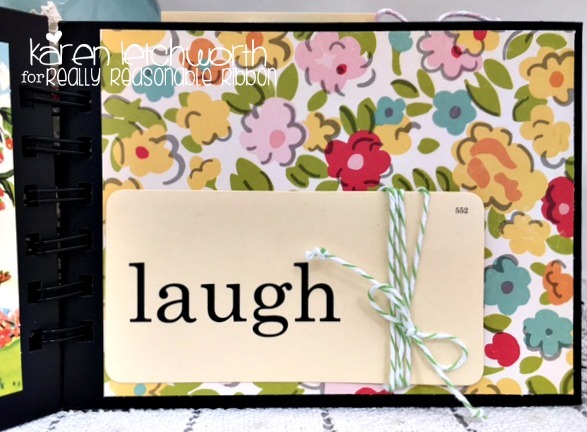 The cover has patterned paper, a white rub-on sentiment (friends) on a chalkboard sticker. I framed the sentiment with a length of Debra Natural Crochet Lace on each side. In the upper right-hand corner, I added a bow that includes Lipstick Red Seam Binding, Black Seam Binding, Solid Red Baker's Twine, Black Licorice Baker's Twine, Debra Natural Crochet Lace, and a vintage black button with a "diamond" in its center. I also added one Red Open End Rose and two Ivory Sweetheart Blossoms. I also tied lengths of Debra Natural Crochet Lace on the binding rings. The second page has a journalling card, stickers, and a button that has a length of both Natural Burlap String and Green Apple Baker's Twine tied into a little orange button that's topped with a small pearl sticker. Another great thing about these envelopes I used to create my mini album is that each envelope opens so that you can tuck in photos, notes and memories of all sorts. 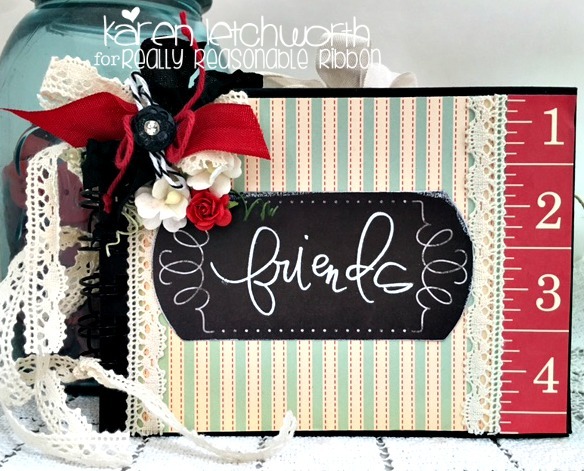 The third page was created by adding a strip of patterned paper to the right side and a sweet "Friends" journalling card in the center and some phrase stickers at the top right. On the left side, I added a strip of Debra Natural Crochet Lace, a bow made from Mimosa Yellow Seam Binding and I also added two Ivory Sweetheart Blossoms. Page four includes another OA journalling tag, a journalling sticker, a lengh of Debra Natural Crochet Lace, and a bow tied with Cream Seam Binding that has a tiny button in its center that has a long length of Natural Burlap String. On to page 5.....this one is pretty simple. I used a piece of OA patterned paper, and then added a (laugh) card that I tied a long length of Green Apple Baker's Twine around several times. I thought that perhaps this page could be used to add a photograph or some journalling. Page 6 is a little bit more involved. I added another cute journalling card that's attached to a cute piece of scalloped patterned paper, and has a length of Debra Natural Crochet Lace on the side. I also added two small journalling stickers (one at the bottom and one at the top left), and two chipboard flowers by the length of lace. Page 7 (above) is my favorite page. I guess that's because it has to do with.....ice cream! I added some sweet patterned papers at the bottom that are machine stitched together to create a pocket. I added a chipboard milk cap on the left of the pocket. Inside the pocket, I tucked in an ice cream journalling card that has a rubber malt charm, and a tiny glassine bag with stickers and a button tied with Aqua Baker's Twine, and inside the glassine bag there is a tiny tag that's tied with Cotton Candy Baker's Twine. 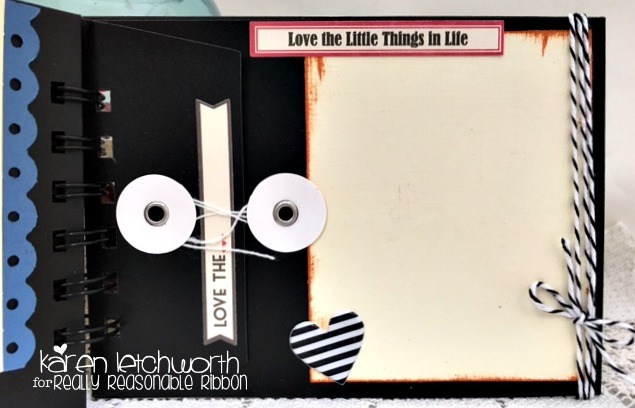 Page 9 is a photo spot with some stickers, a heart, and some Black Licorice Baker's Twine tied several times around the ivory cardstock photo spot. The Black Licorice Baker's Twine can also be seen on the back cover (which I did not photograph). This book will be such a sweet place to put heatfelt keepsakes to document friendships during childhood. Really Reasonable Ribbon really helped me make it sweet and special. I'm so grateful that you've stopped by today to take a peek at my mini album, and I really hope that this has encouraged you stop by Really Reasonable Ribbon to check out all the fabulous ribbons, laces, baker's twine, flowers and SO much more. 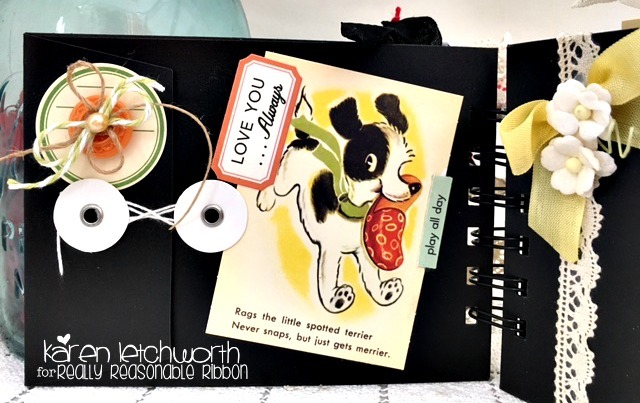 We would also love to have you play along in our current Really Reasonable Ribbon Challenge, and to visit the RRR Blog each day for more inspiration by the other talented Design Team Members. I smiled all the way through it. Adorable!!! Wonderful details about your album and gorgeous. I need to try the chalkboard paper now. My next project is to create an album or front of a notebook for a diary. 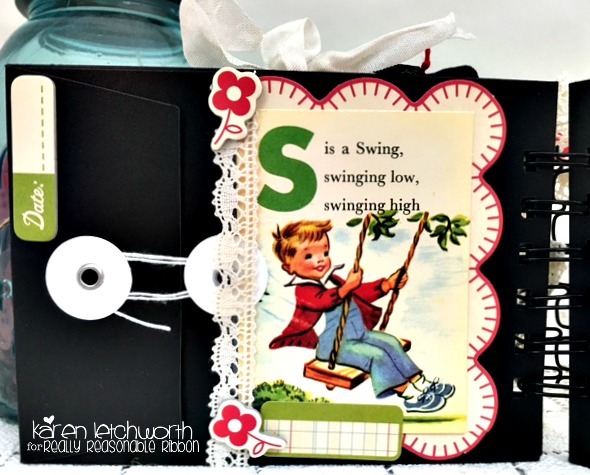 Love the flowers and ribbon that you used. The red and yellow seam binding ribbon are now on my need list for March. Fabulous job on this mini album Karen - I am liking those pockets with the twine - super job - I need to get back to creating mini albums - thanks for the inspiration!